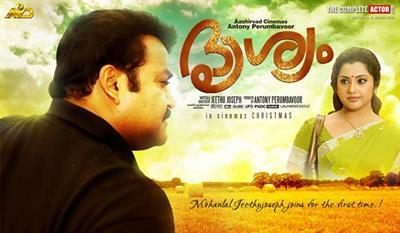 Upcoming Christmas release malayalam movies in 2013 are given here. After a handful of Onam releases, the malayalam film industry is gearing up to give a visual treat for this Christmas too. The upcoming releases include Drishyam, Ezhu Sundhara Rathrikal, One By Two, Salala Mobiles and VK Prakash's untitled movie. So it's much sure that Mohanlal, Mammootty, Dileep, Fahad Fazil and Dulquar Salman would entertain the audience during this Christmas. After the flamboyant Onam releases, the leading malayalam film makers are gearing up to welcome Christmas with their grand projects. Now it is much sure that Mohanlal, Mammootty, Dileep, Fahad Fazil and Dulquar Salman would be having movies which would truly entertain the audience during this Christmas. The big five major releases for Christmas are Drishyam, VK Prakash's untitled movie, Ezhu Sundhara Rathrikal, One By Two and Salala Mobiles. Other than debutante Sarath Sasidharan, the other 4 ventures are helmed by experienced film makers. So it is time to know more details about the 5 mega releases. Drishyam which has already created ripples among the movie enthusiasts would start rolling from the 10th October. The movie which will feature Mohanlal and Meena in lead is a thriller which pools into the life of a villager who is much committed to his family. Set at the backdrops of beautiful locations in Thodupuzha, 'Drishyam' would be a visual treat offered by Jeethu Joseph and his team. Scripted by the director himself, the movie will be produced by Antony Perumbavoor under the banner Aashirvad Cinemas. The soundtrack and background score would be set by Anil Johnson while the Sujith Vassudev will stay behind the camera. With the shooting planned to wrap in a couple of month, 'Drishyam' will reach the theatres on 25th December. Jeethu who is riding high with hits like Mummy & Me, My Boss and Memories is expecting to make a prominent position with his upcoming movie 'Drishyam', touted as a family thriller. Veteran film maker V K Prakash has teamed up with Megastar Mammootty for a new movie which is currently ongoing shoot at Bangalore. Even though Mammotty had a number of big projects in kitty, his priority given to VKP has really surprised many. The story of the movie pools into the mental struggle of a newly appointed advocate named Aravind. Mammootty who started his profession as a barrister was last seen in the role in the movie 'Twenty:20' which was released a few years ago. Mumbai Model Pallavi is known for her acting brilliance on TV would share screen space with Mammootty in the movie as heroine. After delivering a hit with his script for 'Romans', Y V Rajesh has lend his hands for the story of this movie. Rathish Vega has set the music for the movie while it will be blessed with the presence of Manoj Thottayil as the cinematographer. Produced by Plase Salim, this movie would reach theatres during the Christmas. Like his previous ventures like 'Trivandrum Lodge ' and 'Beautiful', this untitled movie would also be an experimental thought from V K Prakash. Ezhu Sundara Rathrikal will bring Lal Jose and Dileep together after 'Rasikan'. This would also be the reunion of director Lal Jose and script writer James Albert after the record breaking super hit movie 'Classmates'. Rima Kallingal who is currently standing at the peak of her acting career would share screen space with Dileep in this movie. 'Ezhu Sundara Rathrikal' revolves around the incidents happened in his seven days before marriage. With Dileep playing the role of an Ad film director, a new heroine will make her entry through the movie. Creamed with humour, 'Ezhu Sundara Rathrikal' would be a fun filled movie which offers clear entertainer to the audience. With the shooting progressing in Kochi, this movie would reach theatres during Christmas. Arun Aravind's upcoming movie 'One by Two' (1/2) featuring Fahad Fazil, Murali Gopi, Honey Rose and Abhinaya would be an ultimate Christmas gift for the movie lovers. With the shooting completed at various locations set at Bangalore, Mysore and Palakkad, this movie would an ultimate thriller placed at backdrops of a hospital. Veteran film maker Shyamaprasad would lend his face donning the character of psychiatrist Dr. Cheriyan. Shyama Prasad who has acquired his degree in Media Production from England is also a product of the School of Drama. Hyderabad born Abhinaya who has enthralled the audience with her performance in the Tamil film Nadodigal would give life to the character role of Raziya in the movie. Abhinaya has already made name for her dedication and acting and also bagged 13 awards in her filmy career. Salala Mobiles written and directed by debutante Sharath A. Haridaasan will have Dulquer Salmaan, Nazriya Nazim and Jacob Gregory in lead. Produced by Anto Joseph under the banner Anto Joseph Film Company, the movie revolves around the life of a youngster who owns a mobile phone shop named 'Salala Mobiles'. Dulquer Salmaan who plays the lead role would romance Nazriya Nazim who has already become the most wanted lady in South India. Standing on the peak of her acting career, Nazriya has already been casted in Dhanush's Naiyandi, Arya's Raja Rani and Jai's Thirumanam Ennum Nikka. Jacob Gregory who had acted alongside Dulquer Salmaan in the film ABCD will also be seen in a prominent role. Gopi Sunder would lend his hands composing the music for the movie. With Satheesh Kurup staying behind the camera as the cinematographer, the movie will be a visual treat for the movie lovers. Sharath A Haridaasan, who had been working behind the screen for the last 13 years as a scriptwriter, short-film director, editor and producer wish to make his entry with blast with 'Salala Mobiles'. So which would be your choice for this Christmas? Drishyam, Ezhu Sundhara Rathrikal, One By Two, Salala Mobiles or VK Prakash's untitled movie? The choice is up to you.